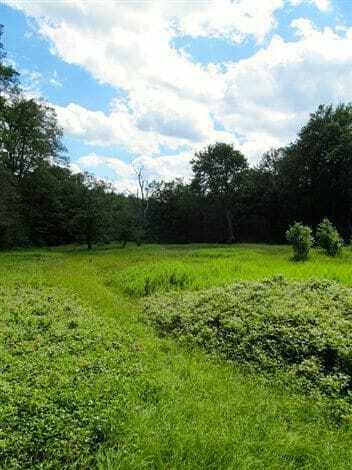 The double-loop John P. Saylor Memorial Trail traverses predominantly flat landscapes to the west of the rugged rise of the Allegheny Front, through Gallitzin State Forest and Clear Shade Wild Area. An easy but lengthy 12.3-mile main loop leads to a more challenging 5-mile side loop. You can hike either loop separately, though the second is more difficult to reach by car. Both loops can be combined to create a figure-eight hike of 17.3 miles, which would make for a relatively easy overnight trip for beginning backpackers, though camping is not permitted in the wild area. The trail is a memorial to John P. Saylor, a longtime western Pennsylvania congressman and conservationist who is best known for helping pass the 1964 Federal Wilderness Act and the 1968 National Scenic Trails Act. Saylor died in 1973. The orange-blazed trail rolls gently through terrain between 2,180 and 2,580 feet in elevation, taking you to unique high-altitude meadows, an old splash dam, the visible remains of railroad trestles, a swinging bridge over Clear Shade Creek (the beginning of the second loop), the relics of old work camps, and scenic but heavily vandalized formations at Wolf Rocks. The forest is mainly of the northern hardwoods type, containing sizable amounts of black cherry, American beech, red maple, sweet birch, and some scattered hemlock. A hike on the 12.3-mile main loop is featured in 50 Hikes in Central Pennsylvania (2001), by Tom Thwaites. ​John P. Saylor Memorial Trail begins at Babcock Picnic Area on the south side of PA 56, about 10 miles southeast of Johnstown. The map for this trail is combined with that for Lost Turkey Trail. ​The guidebook and map published in the PAHikes Trail Guide Series is available at KTA's Bookstore.